Aside from allegedly showcasing its foldable Galaxy X prototype smartphone behind closed doors at CES 2018, Samsung also reportedly revealed its prototype 5G modem, the Exynos 5G, which will reportedly be officially introduced later this year. Currently, Samsung's Exynos 5 chipset covers one of the earlier 5G standards, Release 15. 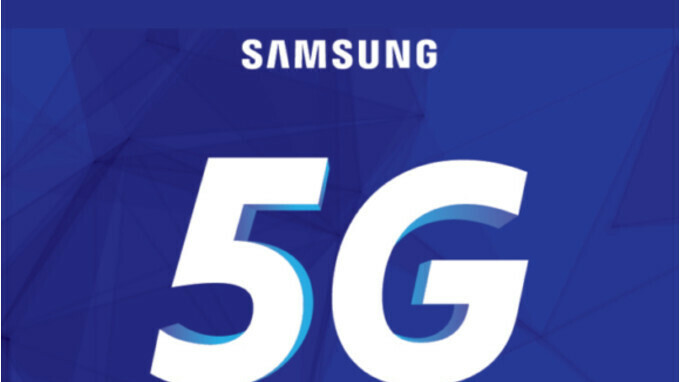 As per Business Korea, Samsung;s Exynos 5 modem works with bands below the absolute 5G spectrum minimum of 6GHz and millimeter waves (or mmWAVEs), which are rather high frequencies in the diapason between 28 and 39GHz. In theory, downlink speeds of up to 5Gbps can be achieved at the moment, which is easily 10x the speeds of contemporary LTE networks. The Exynos 5 is also 5 times faster than the fastest breed of LTE modems available right now - the 1.2Gbps Snapdragon X20 and the 1.2Gbps Cat.18 LTE ones in the Snapdragon 845 and the Exynos 9810, respectively. Of course, the chip is also backwards-compatible with older network technologies and can also fall back to 4G LTE, 3G, and even 2G. It seems that Samsung could be geared for a 2019 release of its 5G modems inside its Exynos chipsets, which falls in line with Qualcomm's anticipated release of its 5G modem in Snapdragon chipsets. Samsung and Japanese carrier KDDI recently demonstrated its 5G technology on a moving train just a month or so ago, achieving peak downlink speeds of 1.7Gbps. 5 times faster than the fastest breed of 4G modems? 5G will be even more badass than I thought. Too bad not all phones will get to enjoy it. Hopefully all phones made in 2018 will all come with 5G gig-speed capable modems. I got a chance to use Google fiber at almost full speed, and OMG it was absolutely amazingly fast. Made Comcast speed look like a turtle in quicksand. Soon I will be able to burn all my mobile data watching 4k videos even faster. I hope this is the start of Samsung ditching Qualcomm completely. About that, can Qualcomm finally be ditched when CDMA networks in the US are retired? But Samsung doesn't have to even use Qualcomm. They used the Exynos in the S6 in the US and it worked just fine. I have no idea why they switched back, unless Qualcomm gave them a huge deal to stay with them. I guess since the SD810 had issues which QC knew worked a deal with Samsung who was their biggest customer at that point. I believed it was said that in order for the S6 to use its own SoC it had to pay a licencing fee to QC ( why I don't particularity like QC. But a legal Patent is a Patent ). Can anyone shed more light on this as I am not really sure? That was my understanding as well. Because of the overheating issues, Samsung opted to pay QC the licensing fee to release the GS6 variants with the exynos processors stateside. Recall, LG and other makers resorted to the SD808. But that was for that year only. In general, it must be fiscally wiser to just use the SD chip rather than pay QC the fees. What I do not know is if they could release phones here on AT&T or Tmobile (i.e., non-CDMA) using the exynos processor without paying the fees to QC. The term of agreement was that Qualcomm would move its Snapdragon fabrication from TSMC to Samsung in exchange for Samsung using Snapdragon in some portion of the Galaxy line up. Qualcomm will be moving back to TSMC for the 7 nm gen fabrication, meaning Samsung will finally drop Snapdragon and go all Exynos in retaliation. I noticed today that Samsung launched the Exynos 7872 which has CDMA support. So, they reached an agreement with Qualcomm to license it. The Exynos 9810 was rumoured to get CDMA support back in June, but nothing has been mentioned since. If it does have CDMA support, then the S9 could come with the 9810 in all markets. It depends on the agreement they reached with Qualcomm. There is that alleged benchmark of the S9 with the SD 845 though. Regarding the Galaxy S6, my understanding is that Samsung paid through the nose for that modem, but they did it to prevent potential trouble with the SD 810. It was said that it cost the same as paying for the full 810 SoC, hence why it's cheaper for them to just use Qualcomm in the US and China. Qualcomm have come under recent pressure regarding licensing fees, which may explain how Samsung have negotiated a deal for CDMA in the Exynos 7872. I think it was actually more than the full cost of the 810. Under the terms of Qualcomm's FRAND licencing the cost of using the modem patents is based on the retail price of the phone and is believed to be as much as 9%. So a $100 phone would pay $9 on the FRAND. A $1000 phone would pay as much as $90. All of which makes it cheaper to buy the full SD off QC Hence the reason Samsung use the SD and the reason Apple are suing QC for unfair practices with it's patents. Isn't 5 more like 4 times 1.2?